I'm a second year CS Undergrad from India. I love Python. This is my first article here on the dev.to community. So let's begin! My college has a general student - login, where students can view their profile, upload assignments, get due dates, download course materials, and stuff. But the site is kind of tedious to navigate through, and hence I decided to use python to automate the boring stuff. 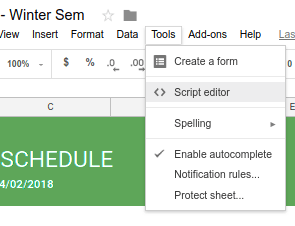 One of them is the Assignment Reminder Service. As for this article, you need to know a bit about how the web request - response model works and simple python knowledge. It will be split into two parts. In my first year, due to my laziness, I tended to miss certain Digital Assignment Uploads. To counter this, I learned Web Scraping using Python. Once I learned how to use the BeautifulSoup and Requests libraries, it became quite clear that if we sequentially emulate what the browser does, we can work with the HTML/JSON responses that we get. I have written up a simple article explaining how I did that here on Dev.to. You can find the repository on my GitHub profile. Here's the link. The chrome developer tools are pretty handy, and I used the network monitor in it. Opened the Website, and in developer tools opened the network monitor tab. 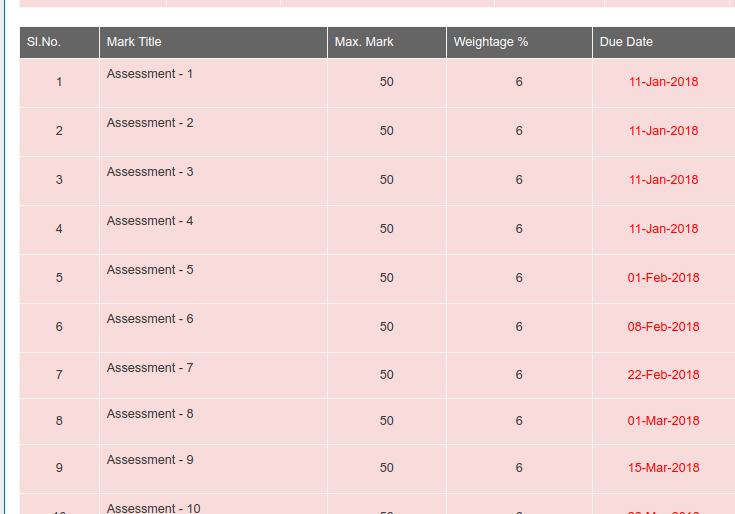 This way, I was able to acquire the HTML content and then wrote few lines to navigate to the assignments page. Once that was done, I used BeautifulSoup, a parsing library in python. What BeautifulSoup does is, parse the HTML response into a tree-like structure, and if I want to navigate to a lower branch I can simply go to the next child and so on. The documentation link is mentioned above. A list of all the pending assignments is returned, in a dictionary-list format after parsing each link. Next thing to do was sync it with the Google Calendar API. The documentation is on - point and pretty easy to understand and implement. The quickstart guide is more than enough to get started. Wrote some lines of code that do sanity checks, and finally, request the google calendar API by creating an event, and the code looked like this. I wrapped this snippet into a function, and for every pending assignment called the function which added the event to my calendar. In addition to this, I developed a chrome extension that automatically cracks the captcha and fills the textbox. It also managed downloads from the university website, categorizing them on the basis of course code and faculty name, and organizing into the respective folders. This one is partial automation, but you can still have a read! Highly Practical. 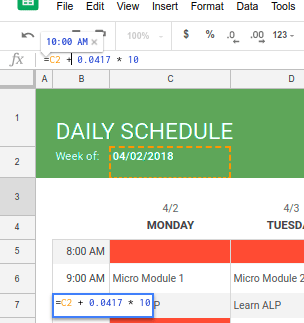 In order to be more productive, I planned to use Google Sheets' Daily Schedule Template. 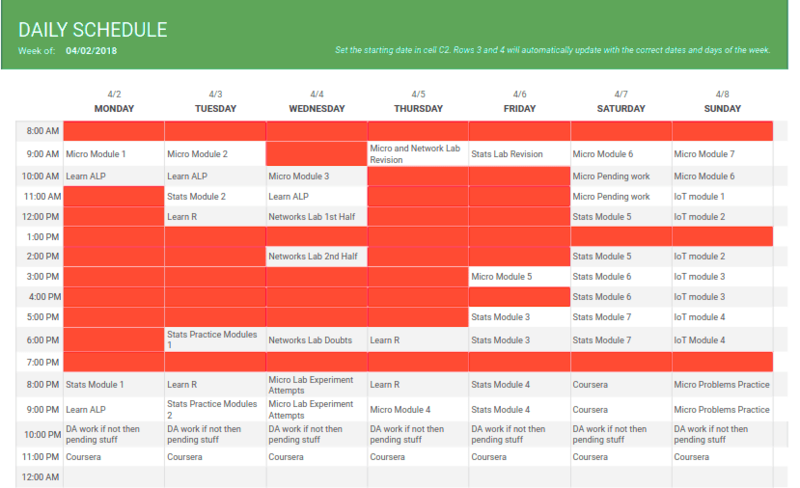 This is basically a week-long activity chart that has days for columns, and times for rows. The red colored regions imply that I won't be available at the time. 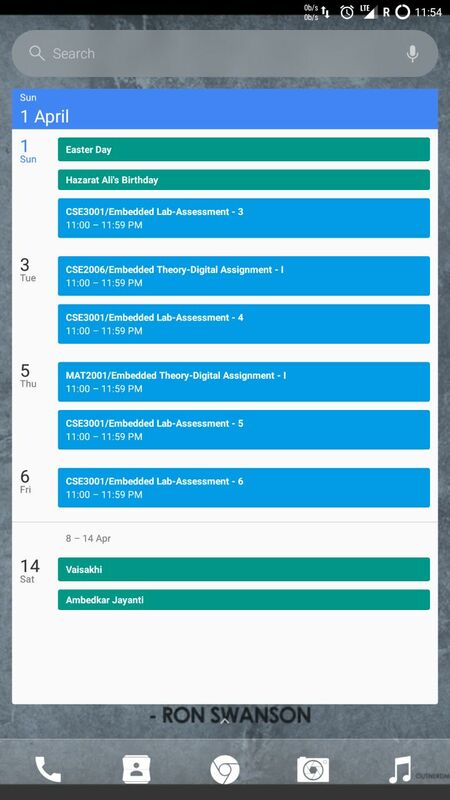 The beauty of this was that since my timetable always remained the same for an entire semester, all I had to do was sit for like 15 minutes on every Sunday night, and plan the entire week. Fill in the schedule sheet. While you're at it, adjust the times accordingly. On the top bar, navigate to Tools -> Script Editor. This is just a sample snippet, but you should have an idea. Adjust it according to your will, use it in a loop to sync all times. I kind of hard-coded it as I was too lazy to look at some of the APIs. Here, C2 is the current week cell. To adjust a cell's property, click on a cell, and head over to the macro section right above the index cells. The hour number if it is 8, then it will equalize to 8:00 AM. I made this change to all the other times, as I wanted an hour wise split up. Here is the script I use now. "0.041666" is basically 1/24th of the day = an hour. I ran this script, and all the events got synced to my google calendar. 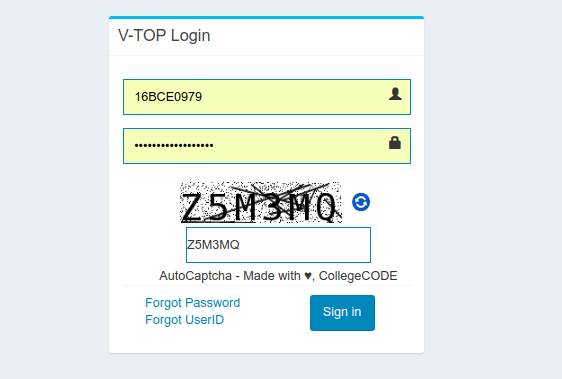 So this is how I've automated some stuff in my college. Let me know if there is anything I can help you with, or if you have any suggestions, in the comments! 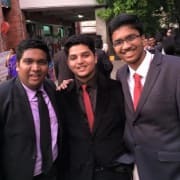 Well done Priyansh and welcome to dev.to! For me the whole process of studying at university seemed to be really boring. And I used any opportunity to cheat from using studymoose.com to using your approach. That's great! I think it's proof of your skills. No need in diploma :) But anyways, thanks for the article. I'm not the best student at college. I have a lot of problems with writing tasks. But I think I found a way to deal with it. I bumped into a review edureviewer.com/services/essayedge... on a service which helps with essays. I believe it's a good solution for my issue. 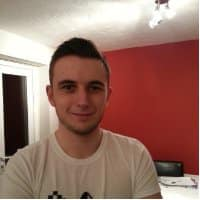 Hey,can you please suggest the best resources to ace in node js. Thanks in advance! Hands on is the best way to learn! This is awesome! The Google Scripts editor is really fun to play around with. Where is the reminders service up for use? I use it in my local system as a cronjob. Could you Share the code or Github link? I sometimes very boring to do paper work and so I use it copycrafter.net/buy-papers-for-col... to facilitate my student days. I am sure that many students dream of having a reliable writer's help at hand, so I will recommend you to visit the site and get acquainted with the services in more detail.